A geiko on her way to work. Photo by Russ D.
Geisha*, geiko, and maiko are traditional Japanese hostesses who entertain customers through various performing arts. In Gion, Kyoto, they call full-fledged geisha “geiko” and the apprentice in training “maiko.” In the olden days, beautiful girls from poor families were often traded into this profession to help support their family. Nowadays, teenage girls choose for themselves to enter this profession and to carry on an ancient form of performance art. Though the culture has evolved, strict rules and pecking order in the geisha society remained. At first glance, a geiko has minimal accessories and both top and bottom lips are red; a maiko has more accessories to entertain with attractiveness since she is still working on perfecting her skills, and can only color her bottom lip red. An easy way to distinguish by clothing is that geiko wears a bow on her back while maiko wears a long sash draped behind. Even a detail as small as the length of one’s eyebrows is significant. Surely the clients will know more ways to identify the two? As a tourist attraction, the City of Kyoto promotes geisha wear. Therefore many visitors can dress and walk about town in kimonos to immerse themselves as geisha. Look carefully to spot the real deal! 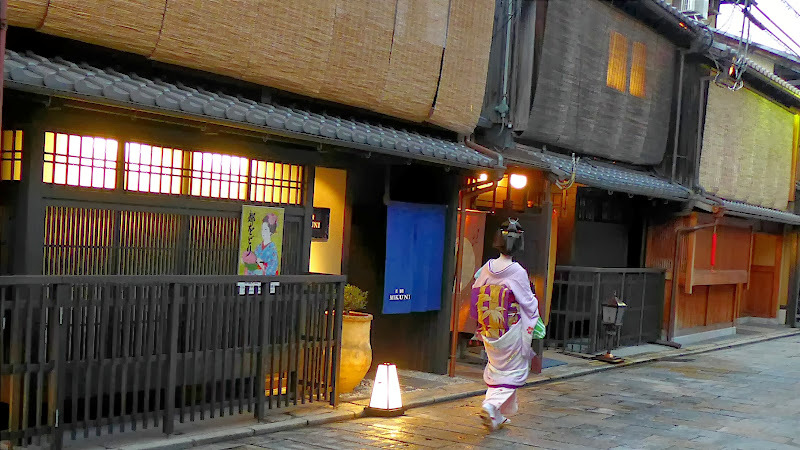 A geiko leaving the boarding house on her way out to work. How much is it to hire these entertainers? The tea house a geisha entertains at provides an experience where the clients can be as carefree as possible. The market rate to hire geisha for an event is top secret. Our guide explains that based on word of mouth estimates from several sources, the average rate is around $1,000 per person for two hours, commuting time included. It is tradition that a new client can only be introduced by trusted regular client, and the introducer is responsible for the full bill. The bill is not paid upon the end of the event but rather a month later and the payment amount is undisputable. The entire system is built upon trust and confidentiality. 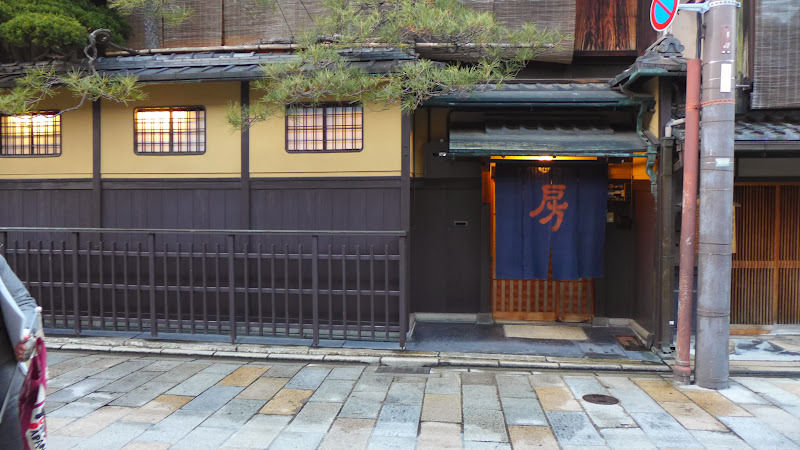 A traditional tea house. You can tell by a small plaque next to the entrance that says “tea house”. How far will they go to entertain clients? The storyline in the book and film Memoir of a Geisha depicts a ritual of auctioning a geisha’s virginity. Because of that, the impression of geisha has been tainted worldwide. Although there are women in other professions with similar looks as geisha who will comply with a client’s request “to the end,” our guide promises that those women are not geisha and do not have the same training or practice as geisha. It is not uncommon for a geisha to marry her client, but she must retire. There is no married geisha. Mineko Iwasaki, the geisha in which Memoir of a Geisha book was based on, sued the author for breach of confidentiality and defamation after the book was released. Geiko and maiko on the move are also on their way to work. We may photograph them but were instructed to not block their way or interrupt by talking or touching. Remember, their commute time is paid by the clients as well! We booked with Waraido for the night tour in Gion. Our guide Shomi was very knowledgeable and spoke fluent English. The cost was very reasonable and Shomi really went out of her way to help us find opportunities to spot the geiko and maiko in the city. We also got plenty lucky during our tour as the first maiko we saw, maiko Tomitsuyu-san, was being interviewed by Juju Chang from ABC’s Good Morning America. Can’t wait for that segment to air! We will be testing our luck again today and hopefully get more geisha photos to share! *Geisha, like all Japanese nouns, has no distinct singular or plural variants. Next story What’s the Most Popular Country In the World? Previous story Porto Oporto, the Inspiration for Harry Potter?